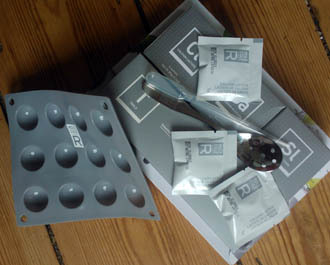 Molecule-R Molecular Mojito Kit - mixology for beginners! 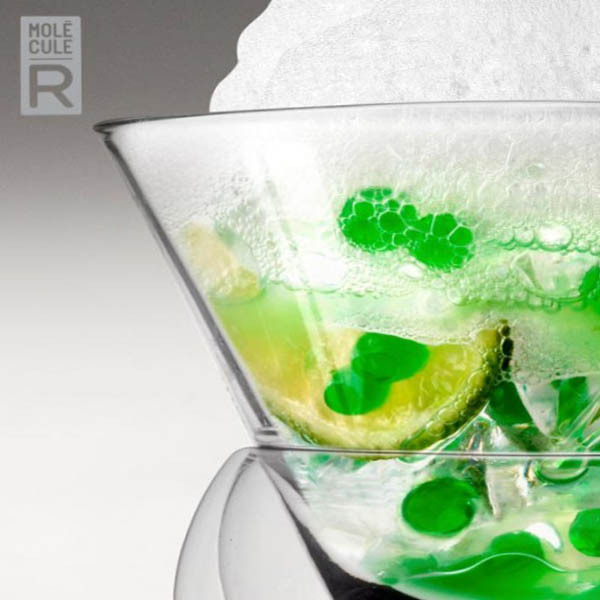 Use this Molecule-R Molecular Mojito Kit to transform a simple cocktail into something unique and intriguing. 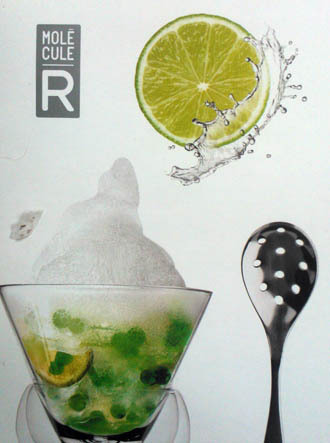 This kit uses modernist mixology techniques to add a whole new dimension to the standard Mojito. Everything is included in the kit with simple to follow instructions so even if you have absolutely no experience of molecular mixology you’ll be able conjure up something special. 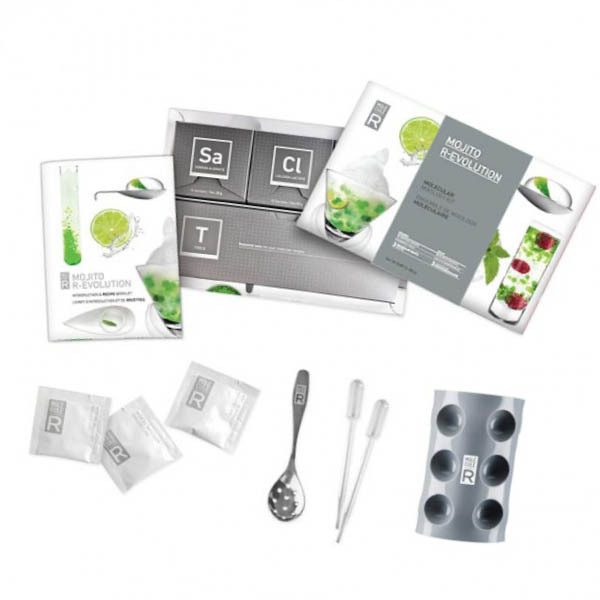 The kit provides everything you need to make three styles of Molecular Mojito. 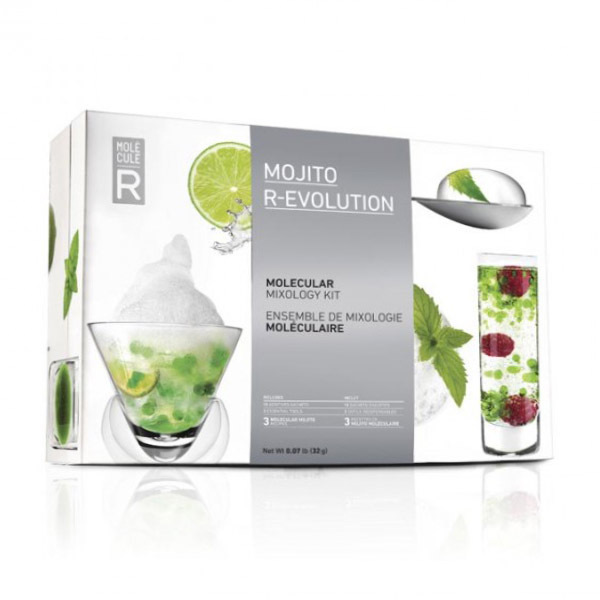 It might sound complicated but it really isn’t… just follow the instructions… Molecular Mojito The techniques covered by the kit are three mainstays of the modernist cocktail: Spherication, Emulsification and Reverse-Spherication. 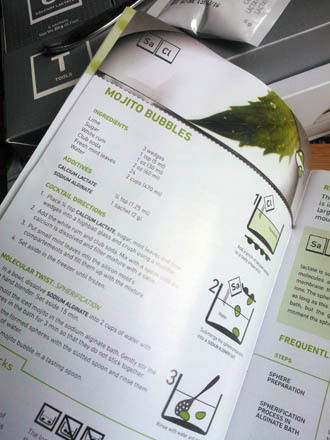 Once you’ve mastered these with the Molecular Mojito Kit, you’ll be able to apply the same techniques to other cocktails using the equipment included in the kit. 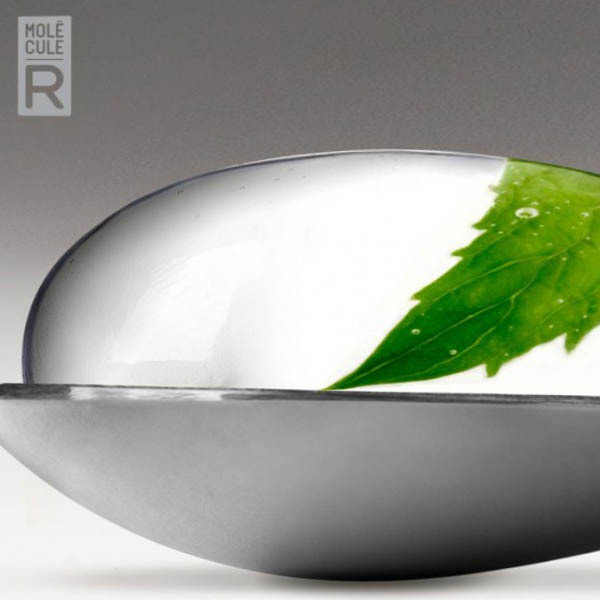 Use this Molecule-R Molecular Mojito Kit to transform a simple cocktail into something unique and intriguing. The techniques covered by the kit are three mainstays of the modernist cocktail: Spherication, Emulsification and Reverse-Spherication. Once you’ve mastered these with the Molecular Mojito Kit, you’ll be able to apply the same techniques to other cocktails using the equipment included in the kit. This really is a lot of fun and once you’ve tried out the recipes and feel confident then creating them can be part of the show as you make molecular mojitos for your friends. Emulsification: creating a foam – Cloud of Sugar - that floats on top of the drink giving a twist on the sugar element of the drink. Reverse-Spherication: making bubbles of Mojito – the drink is encapsulated in a gel and literally eaten off a spoon so the Mojito Bubble “pops” in your mouth. 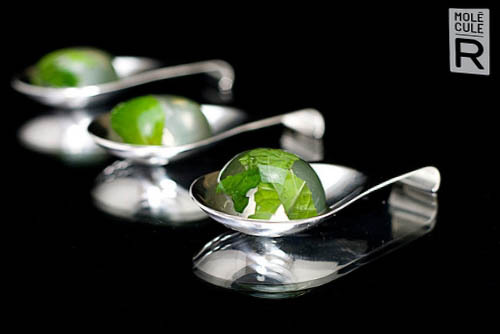 Basic Spherication: create floating caviar containing the mint component of the Mojito. All three of these techniques are mainstays of the modernist world and will crop up again if you continue to explore the depth and breadth of molecular gastronomy/mixology. And the ingredients you need to molecularize your mojito – these sound very “science” but all are derived from natural ingredients. And of course it includes step-by-step instructions that can easily be followed by a novice, with simple instructions and more detailed science explanations for those that have inquisitive minds. You’ll also need an immersion blender (stick blender) or a blender. As with many traditional cocktails the precise history is a mix of magic and folklore – but what is firmly established is that the drink originated in Cuba and contains only five ingredients Rum, sugar, mint, soda, lime (although the Molecule-R molecular mojito kit adds three more). All of the ingredients had long been available in the West Indies due the sugar cane that makes the rum and the sugar syrup were part of the reasons for the establishment and development of the Islands by the British/Spanish with their wicked slavery. One story suggests that four of the ingredients (not the soda) were used together as a treatment for scurvy by the early sailors. The recent upsurge in popularity of the Mojito is partly due to the fact it tastes great – with the sugar and mint beautifully off-setting the sour of the lime and the harshness of the rum. For cocktail novices the mojito perfectly illustrates the need for “balance” in cocktails. Bacardi all but trademarked the name as they plugged it relentlessly in the summer of 2006. There are plenty of variants on the Mojito using different flavours and spirits – but as with many things the beauty of it is in the simplicity. 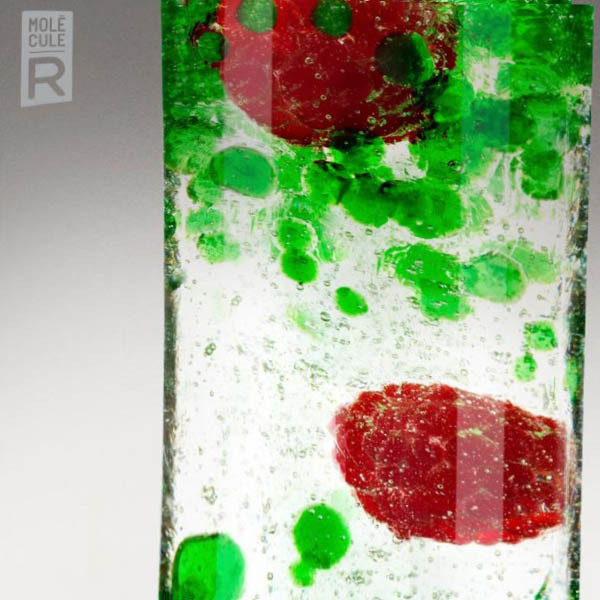 The Molecule-R molecular mojito kit doesn’t mess with the essential simplicity of the drink – the molecular ingredients don’t alter the flavour but rather play with the textures of the drink, making foams and gels from those basic five ingredients – soda, lime, mint, sugar and of course the rum! So, what are you waiting for - you can now enjoy your Mojito, impress your friends and play at being a scientist all at the same time! We will be stocking replacement chemicals so you can replace the three key ingredients when needed and continue your experimentation… if you are still undecided then watch the video to see how simple it really is to make Mojito Bubbles, Sugar Clouds and Mint Caviar! 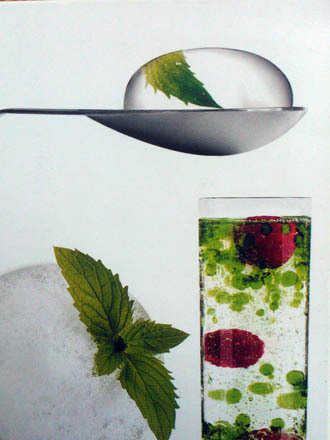 If you want to take it all one stage further you can always use a soda syphon to carbonate your mojito spheres. It's not just for fun - real cocktail bars are making their own molecular mojitos too! Another recipe can be found at Culinary Science. A neat little podcast/video can be found over at BartenderHQ.